My husband and I have been together for 15 years, married for 10, and I still have the hardest time shopping for him. I know it’s not just me either- I know a lot of gals that have a hard time buying for their husband/boyfriend/father/brother/all of the above. I don’t know what it is about guys that makes it hard to buy for them. Unlike me, my husband isn’t constantly telling me what he wants (while my husband could probably list a million things I have said I want), nor does he feel as though he ‘needs’ anything. 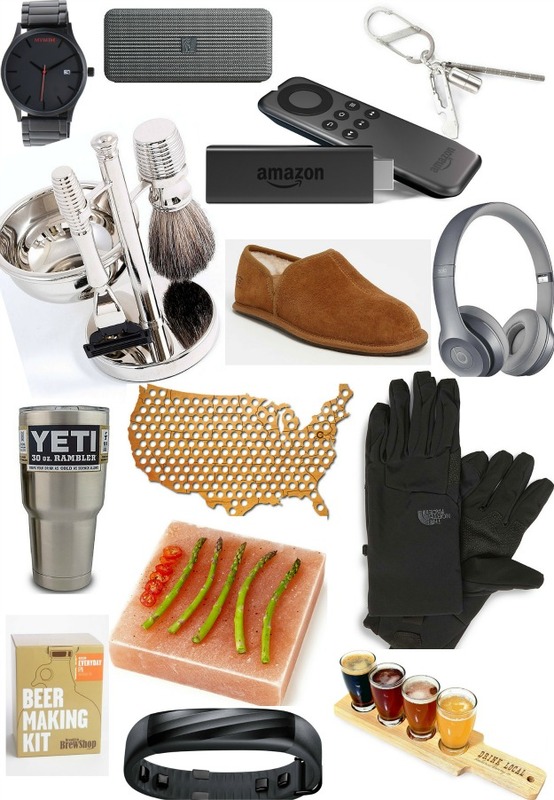 Even making this gift guide every year is a challenge for me, because guys in general are just tough to buy for! But, worry no more. I searched high and low, and high and low again for some decent gift ideas for the dude in your life. Some of them aren’t the most groundbreaking, but some I think could be a definite hit! MVMT Watch: I love this stainless steel watch so much I would wear it! Soundfreaq Pocket Kick Wireless Speaker: What dude wouldn’t want a wireless speaker? It holds a charge for 10 hours and would be perfect for any sort of excursion or outing for your guy! Amazon Fire TV Stick: If your household is anything like mine, you’ve gotten rid of your DirecTV (or whatever you have/had that is similar). We have been watching a lot on Netflix and Hulu, but from time to time miss all that live TV has to offer (we do get a limited number of local stations). Fire TV Stick connects to your TV’s HDMI port. You can watch over 250,000 TV episodes and movies on Netflix, Amazon Video, HBO GO, and Hulu, plus you have access to games, music, etc. You can also watch the best of live TV, too! EDC Kit 2.0: Known as the Every Day Carry kit, it is the perfect go to for guys (think of the Minimergency Kit for guys). It has a Nite Ize DoohicKey (which is a Box Cutter, bottle opener, wrench, ruler, and flat head screw driver), and Inchworm (which you can use to do things like check tire depth and measure things), a Peanut Lighter, Runt Clip and a Nite Ize S-Biner. Mach3 Shaving Kit: There is something about an old fashioned shaving kit that I love. It feels so old school, and legit for some reason. Like you will automatically have a better shave by using it or something! Scuff Romeo II Slippers: Who doesn’t love a new pair of slippers. These are a little bit of a splurge, which I chose on purpose. The past several years my husband and I have been buying less expensive slippers, which only last a season. Which means every winter we buy a new pair. Here is a genius idea…buy a super nice pair that lasts more than one winter! These should do the trick! Beats Studio 2.0 Headphones: I bought a pair of these a couple of years ago for my husband and it was well worth the price. He uses them all the time (mowing the lawn, when we travel) and they are really great quality! They sure beat my dinky earbuds that came with my cell phone that I use! Yeti Tumbler: Apparently these things are crazy good and worth the price! They keep ice two times longer than a regular plastic tumbler and do the same for hot drinks as well. Great for guys on the go! Beer Cap Map: This is probably my most favorite pick! Instead of tossing your beer caps, you can turn them into a conversation piece! This particular beer cap map is made with birch wood. It displays the geographic origin of your brews! You can even get a beer cap map for your particular state. NorthFace Waterproof Climateblock Gloves: Nothing to say about these other than they are a necessity! Something like gloves (at least for me) is something that I wouldn’t typically buy for myself but would love as a gift! Everyday IPA Beer Making Kit: I don’t think I have ever met a guy who hasn’t wanted to make his own beer at some point in his adult life. Why not help get him started? This particular kit is only $40, which is a great stepping stone into the beer making hobby! Himalayan Salt Plate: For the cook in your life, this is an awesome addition to their kitchen. It retains hot and cold temperatures evenly. You can heat it on the grill to cook thin cuts of meat, fish and shellfish or you can chill it in the refrigerator to serve cold appetizers like cheese, sushi and fruit. What’s cool is the plate can be used repeatedly until it eventually diminishes! UP 3 by Jawbone Activity Tracker: This is a great gift for the athletic guy in your life, or someone who wants to focus on getting into shape. It’s a nice gift to get for yourself, too so you two can stay on track together! Drink Local Beer Flight: This would be a great gift to accompany the beer making kit. This beer flight sampler is a stylish way to share samples of your home brews, or your favorite, local brews! 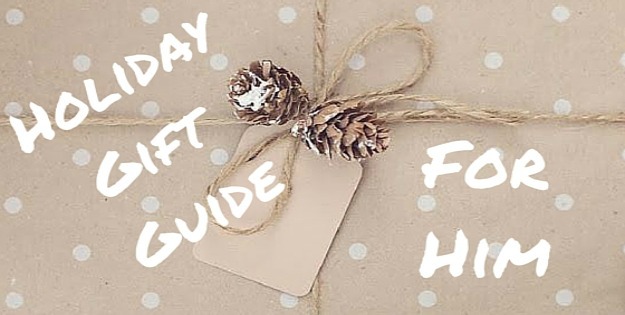 Don’t forget to check out my previous gift guide, Gifts Under $50! Next week I will share my Gift Guide for Her!